Lewis Hamilton was left free to secure a simple Singapore Grand Prix win and open up a 40-point lead in the drivers' championship after Ferrari "disappeared" at the Marina Bay Circuit. Sebastian Vettel could only come home third as the Scuderia's title hopes continue to fizzle out. 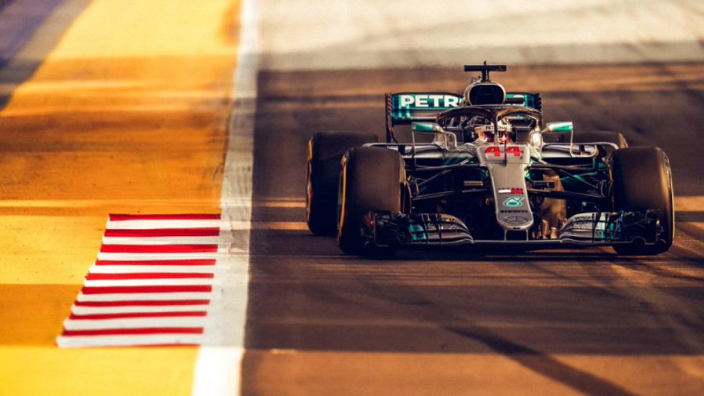 After a supreme qualifying performance, Hamilton made the perfect start off the line and was then able to see out a seventh win of the season as Vettel and Max Verstappen fought over second place behind him. Although a brief scare behind scrapping backmarkers raised Hamilton's heart-rate, he was a relieved man after taking the chequered flag first for the 69th time in his career. "I'm spent! That was a tough race, I have such great support here and we had a great start," he said. "The team have never given up faith and belief in me and Valtteri. "It felt like the longest race of my life, I'm glad it's over. Max put up a good fight too, what a weekend. It's a blessing. I'm just blessed. "I was a little but unlucky with the traffic, these guys [Romain Grosjean and Sergey Sirotkin] were moving and it was difficult to follow. Max was lucky I think, and the guys wouldn't let me by, my heart was in my mouth but once I got past I could put the pedal down and just had to go." Of his title rival's inability to contend, Hamilton added: "The Ferraris put a good fight this weekend but I'm not sure where their pace disappeared to in the race.